If your property is flooding and require immediate assistance please call now 604.639.0990. We service all cities across the entire lower mainland. Drying behind cabinets, tile splashes/surrounds, insulated walls and beyond used to be near impossible. In most cases, there was no choice but to remove and dispose of the water damaged materials – at great expense to the customer and the insurance company. However, advancements in restoration technology allow us to direct high-pressure air into hard-to-reach areas and dry them quickly with minimal disruption. 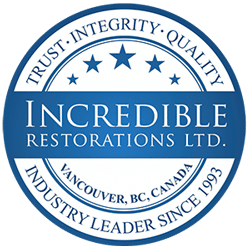 At Incredible Restorations, we began adopting this technology a few years ago, and continue helping insurance adjusters, stratas, and homeowners minimize the cost and timelines to dry and repair their properties. So why hire Incredible Restorations? So what is structural drying? This is a technique using advanced drying technology to quickly and efficiently dry the saturated structural building materials minimizing the demolition required to dry behind the wall. Our IICRC certified water damage technicians install these systems to deliver warm, dry, high-pressure air into these spaces for fast, effective drying. So what is is in-place drying? In-place drying is drying affected materials with zero disruption. For example utilizing a floor drying system to dry a hardwood floor in place, or installing drying equipment inside a contained environment for an extended period of time. Another great example is drying tiled shower surrounds, usually these are very expensive repairs that can be totally avoided by using the right technology are the time. Our goal is always is minimize disruption at all costs, and return the property back to pre loss condition as soon as possible. Our 24-hour emergency line will connect you with one of our certified professionals who will advise you what to do to minimize damage until our technicians arrive. A crew of friendly professionals will be dispatched immediately and will arrive on site within the hour.